The UK's trade deficit widened sharply in April to its highest level in almost seven years, largely thanks to a slump in car and chemical exports. Official figures showed the seasonally adjusted deficit was £4.4bn, compared with £3bn in March. The worsening deficit was driven by an 8.6% fall in overall exports, including a 6.8% drop in exports to other European Union nations. 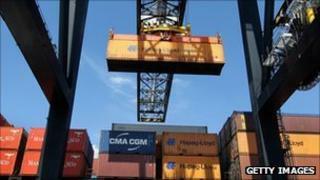 Analysts said it highlighted the continuing weakness in the UK economy. In April, the total goods trade deficit was £10.1bn, according to official figures, compared with £8.7bn in March. At the same time, the services surplus was £5.7bn in April, slightly lower than March's £5.8bn. Peter Dixon, from Commerzbank, agreed that the latest trade figures added to a weak picture of the UK's economic health: "I think if you look at where we are now... it does imply we're on a deteriorating trend. "It suggests that yet again the eurozone crisis is beginning to have a bigger drag on exports and as a consequence a bigger drag on Q2 GDP [second quarter gross domestic product] numbers. Along with the extra public holiday, it doesn't bode well."